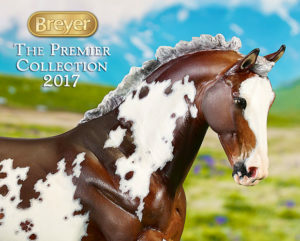 I have been a member of the Breyer Premier Club for the past several years. This year, Shannondell was my favorite model. 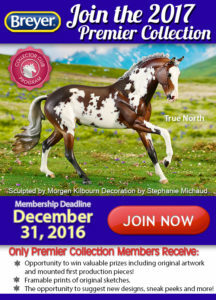 The Breyer 2017 Premier Club is now open for renewal. Breyer posted a picture of the first 2017 Premier Club horse. His name is True north and he is sculpted by Morgen Kilbourn. Morgen was also the sculptor of Wyatt. True North was decorated by one of my favorite painters, Stephanie Michaud. His paint job definitely let’s Steph’s unique painting style show through! Just seeing these pictures of True North has convinced me to join the 2017 Premier Club. Will you be joining? 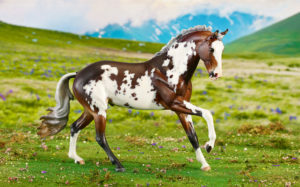 « Buy 2 and Get 1 At 20% Off & New Breyer Stock On The Way!